Aids in Milk Fever (hypocalcaemia) and aids in preventing its inception during the first weeks of lactation. How is Rudduck Double Cal administered? At the first sign of Milk Fever, the treatment should be regarded as urgent. To lessen the danger of the cow choking it is recommended that an effort is made to ensure the cow is sitting up if possible. A bale of hay or a fence post can be used to prop the cow up if available. If possible, warm solution to body temperature prior to injection. Snap the tip off the plug, ensuring the solution can flow freely and connect the sterile needle provided. Disinfect the injection site and insert the needle under the skin of the neck or over the ribs. Gently squeeze the bag to inject the contents. The area should be massaged firmly following injection to allow for quicker absorption of the solution. If the cow does not respond to Double Cal within 3-4 hours repeat injection and seek veterinary advice. 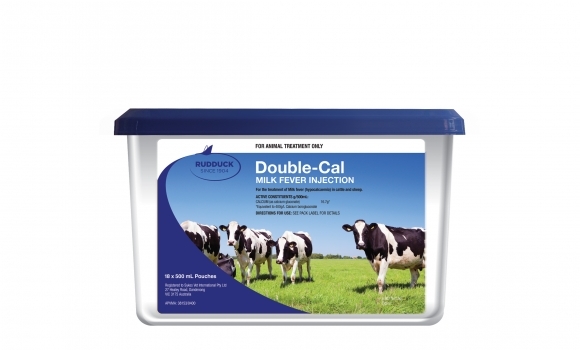 Minbal 4 in 1 should be used when the animal does not respond to Rudduck Double-Cal as the animal may be lacking in other minerals. Use of this product intravenously can be hazardous to the animal and advice from a registered veterinary practitioner should be sought. This product must be injected subcutaneous. All care must be taken to deliver the dose slowly whilst monitoring the cows heart closely.